Born in Milan, October 1947. European Museum Academy Scientific Director. Independent museum consultant and specialist in industrial heritage interpretation. Consultant to the International Foundation Forum of Slavic Cultures, Ljubljana. Twice Fulbrighter at the Pennsylvania State University and later at the Historic American Engineering Record and at the Smithsonian Institution, Massimo Negri has written several books and essays on industrial archaeology and museology. Member of the Jury of the European Museum of the Year Award and of the Council of Europe Museum Prize (now the European Museum Forum, operating under the auspicies of the Council of Europe) from 1983 to 2009, he has been the EMF Director from the end of 1999 to the end of 2009. Founding Member of the European Museum Academy Foundation. From January 2010 to the end of 2018 Director of the European Museum Academy, The Hague. Member of the Executive Board of the European Digital Library Foundation in the period 2008-2010. He has also been for six years the Italian Representative in the International Committee for Industrial Heritage Conservation (TICCH). Massimo Negri also teaches Museology at the Post Graduate Master Course in Industrial Heritage of the University of Padua and has been consultant for the Higher Education Courses of the Scuola Normale di Pisa in cultural heritage (Volterra and San Miniato Courses) where also taught Museology. He is also contributor to the research programmes of CERMEC, Research Centre on Cultural Institutions Management of the Cattaneo University in Castellanza (Varese), teaches also in the Course of Scientific Museography at Cosmocaixa, Barcelona. Formerly Member of the Advisory Board of the British journal “Museum Practice”. In the last 25 years, he has been enlarging his activity in the area of museum studies, temporary exhibitions organization and consultancy as well as teaching at university level in museology and heritage interpretation related matters. An active lecturer, he is regularly invited in Italy and abroad to speak on industrial archaeology, museum innovation and cultural programming. Frequently invited also to lecture and hold seminars in Italian and foreign universities. Consultant, researcher and/or partner in EU projects. He has coordinated many research projects for public administrations in Italy in the field of industrial heritage intepretation and wrote (with Antonello Negri) the first Italian book on industrial archaeology (L’archeologia industriale, D’Anna, 1977). From 1997 to 1999, he has beeen sitting in the Executive Committee of the Board of the National Museum of Science and Technology "Leonardo da Vinci" in Milan. He has been or is still a member of the Scientific Committees of several cultural bodies like the L. Micheletti Foundation of Brescia for the new local industrial museum project (in this capacity he is also involved in the ASSET Project), the Centro per la Cultura d'Impresa of Milan, the Casa Cervi Museum, he has also been member of the Board of Consultants of the Triennale Design Museum. He was also consultant for training with the Italian Association of Company Museums and other organizations. As a consultant to the Municipality of Milan for exhibition programming and museum innovation from 1993 to 1997 , he took part into the start up stage of various important projects, like the renovation of Palazzo Reale, the reconstruction of the Pavillion of Contemporary Arts, the restyling of the Museum of Milan and the Museum of Contemporary History, etc. In year 2000 he was hired as consultant for establishing a new company museums system by the Provincial Government-Dept. of Cultural Affairs of Milan and has been serving in that office till 2009. He cooperated with the Institute for Cultural Heritage of the Emilia Romagna Region (IBC) for the planning and direction of the annual Bertinoro Workshop since 1996 to 2010. From 2008 to 2013 Director of the Museological Project of the Museum of the History of Bologna and then Scientific Director to the for the development of the local City Museum project; Genus Bononiae. Advisor for renovation of the Gallery of Applied Arts in Palazzo Barberini, Roma. Advisor to the Victoria Museum of Melbourne for the Pompei exhibition project. Member of the winning group of the international contest for the new Museum of Arts , design and Architecture of Oslo. During the years he has also created the concept of several museums and temporary exhibitions in Italy and abroad. In 1993 he was awarded the Orden of Isabela la Catolica by the King of Spain for his contribution to the development of cultural relationships between Spain and Italy. 2016 registered the 100th anniversary of Kenneth Hudson birth. For the ones who had the privilege to work with him and to be friends to him sharing year after year hopes and delusions, success and failures, it was a further occasion not only to remeber him , but also to miss his witticism and endless stream of bright ideas. Ten years after we started working together, he wrote a profile of me which is not only still very gratifying, but denotes his sense of humour and his skills in sketching a character , even a modest one like mine. I apologise for this small narcissistic temptation. 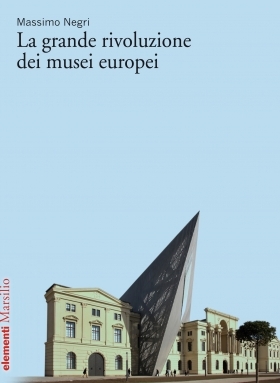 Pubblicato da Marsilio , nella collana Elementi:"La Grande Rivoluzione dei Musei Europei" di Massimo Negri. Presentazioni: seguite su Facebook e su sito Marsilio per date e località !